Michael’s On East has been awarded its 29th consecutive Four Diamond Rating by AAA. Michael’s On East Co-Proprietors Michael Klauber and Philip Mancini accepted the award during a brief presentation the morning of Thursday, June 28, 2018. Michael’s On East is the only AAA Four Diamond Award restaurant in Sarasota, Fla. 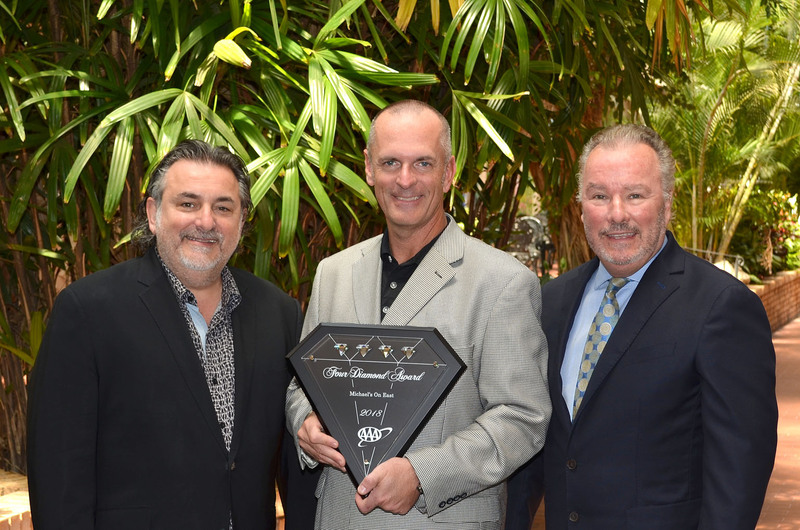 The AAA Diamond Rating Process is North America’s premier restaurant rating program, performed each year by professionally-trained evaluators from AAA’s national headquarters. 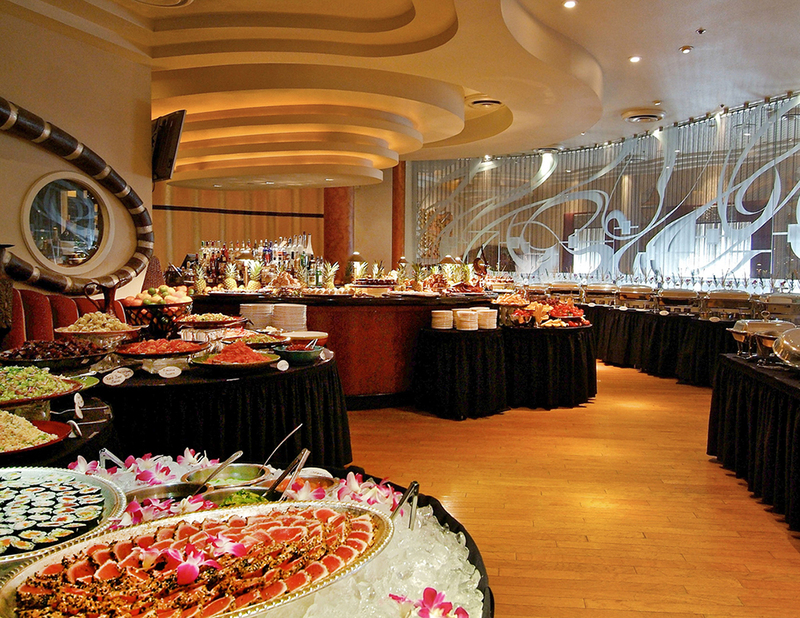 Only 2.2 percent of the more than 31,000 restaurants rated qualify for the AAA Four Diamond Award. AAA defines a Four Diamond restaurant as being geared to individuals in search of a distinctive fine-dining experience. 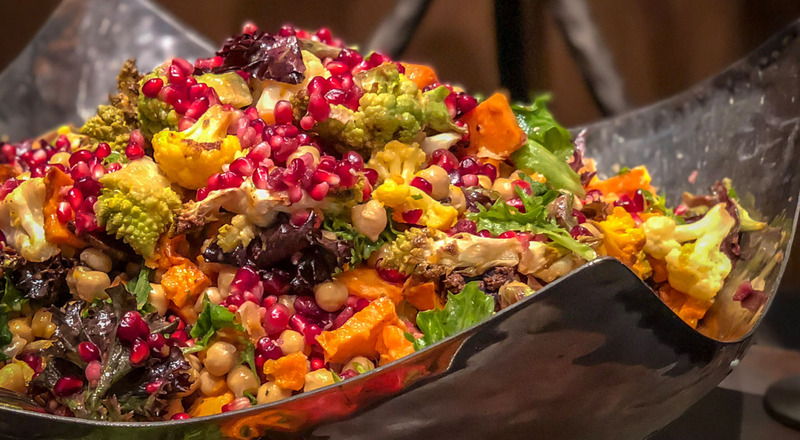 Often orchestrated by an executive chef and an accomplished staff, menus reflect a high degree of creativity and complexity, using imaginative presentations to enhance high quality, market-fresh ingredients. The equally proficient service staff demonstrates a strong desire to meet or exceed guest expectations. A wine steward is typically available to provide menu-specific knowledge on wine selection. The ambiance is highly refined, comfortable and well-coordinated, incorporating quality materials and a variety of upscale design enhancements to give a first-class impression. There are no payments or membership dues associated with the AAA rating system to ensure objective and trusted reviews. School's out for the summer. Travel schedules are in full swing. Hopefully many in the local business and philantrophic community can breath just a bit in our slightly "sleepier" summer season. Guests are also invited to enjoy half-priced bottles of wine on Thursdays in the Restaurant at Michael's On East during lunch or dinner. Wine Lovers Thursdayspresent an opportunity to explore the 350-bottle wine program in the Restaurant which has been recognized with the a Best of Award of Excellence from Wine Spectator. All are invited to join the Gulf Coast Connoisseur Club loyalty program which rewards guests for their good taste in the Restaurant, Wine Cellar or online at www.gulfcoastconnoisseurclub.com. Our culinary team is pleased to share another featured recipe from the Michael's On East kitchen! As presented on this month's Epicurean Adventure and featured on ABC 7 by Michael's On East Sous Chef Kory Minor on June 14, 2018. Cut the corn off the cobs using a very sharp knife. (The trick is to cut about half way through the kernels, then go back and scrape the cobs with your knife to extract all of the milk into a bowl. Reserve the corn milk.) Melt the butter in a two-quart sauce pan, add the Tasso and cook on medium-high heat until slightly brown. Add the corn, onion, celery, bell pepper, thyme and a healthy pinch of salt and reduce the heat to medium. Cook for 15 minutes stirring often, until the vegetables are tender. Add the garlic, okra, tomatoes, reserved corn milk and another pinch of salt. Cook for another 15 minutes, stirring occasionally. Add the green onions, salt, black pepper and cayenne to your taste. Combine the paprika, garlic powder, onion powder, thyme, black pepper, cayenne pepper, basil and oregano in a bowl until evenly mixed. Store in an airtight container in a cool, dry place. Dredge onion rings in Wondra. Shake off excess flour and fry until golden. Season with salt and set aside until the dish is ready to be plated. Season the scallops with blackened seasoning. Add the oil and sear scallops over medium-high heat on both sides until the scallops are blackened. On four large plates, divide the Crawfish Maque Choux, place the kale top of the Maque Choux and then top with scallops and grilled sausage, evenly distributed. Finish with the onion rings and serve! 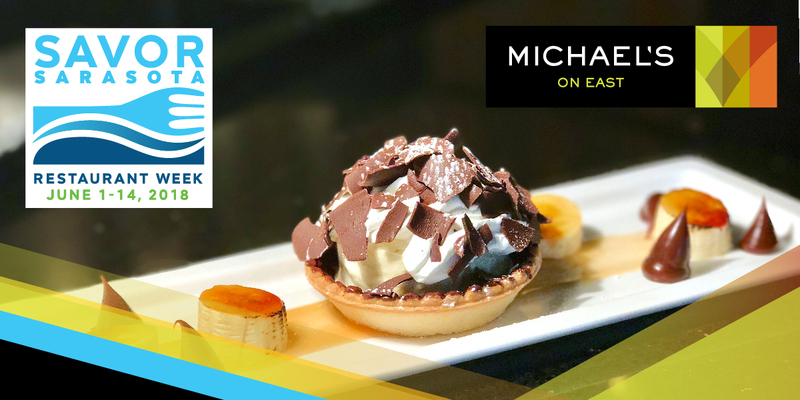 In celebration of “Savor Sarasota Restaurant Week,” Michael’s On East will offer specialty lunch ($16) and dinner ($32) menus, June 1-14, 2018. We invite you to enjoy special wine pairings for $8 per glass or $15 for the pairing. Available during Lunch and Dinner. The three-course “Savor Sarasota” dinner menu is available Monday through Saturday evenings for $32 per person, June 1-14, 2018. The two-course lunch offering features a choice of entrée and dessert for $16 per person and is available Monday through Friday, 11:30 a.m. to 2 p.m.
Beginning on June 15 and continuing through June 30, Michael’s On East will extend the featured multi-course menus for $38.95 during dinner and $19.95 during lunch. Often people will use the phrase "say cheese" as a cue to enter their final pose and to smile. Here at Michael's On East we "say cheese" because we love the new selections we get from our friends at the Artisan Cheese Company! We have a fabulous choice of meats and cheeses in our Made in America Charcuterie dinner starter! Located in Thurman, New York, near the near the Adirondack Mountains, Nettle Meadow Farm is owned by Sheila Flanagan and Lorraine Lambiase. The origins of the farm started in 1993 when Raynald Hebert and his wife Laurie Goodheart transformed an old farmstead, developing a small cheesemaking facility and enough acreage to support approximately thirty goats. The name “Nettle Meadow” was a reflection of the presence of wild nettles and herbs that made up the goat’s diet. Twelve years later in 2005, the farm was sold to Sheila and Lorraine, both of whom had been living in California and were wanting a complete change of direction. Since 2005 they have worked extensively to expand the farm and its operation. Now spanning 50 acres, it is home to over 300 Alpine, Nubian, Saanen and mixed breed goats, several dozen Icelandic and East Freisian sheep and a variety of other farm animals. In 2012, estimated cheese production will be about 125,000 pounds of cheese. From the makers of the award-winning cheese Kunik, Nettle Peaks is a handmade, mold-ripened, black ash drizzled, 100% goat's milk pyramid. It is infused with flavors of nettle tea and other herbs, not because these ingredients are added to the recipe by the cheesemaker, but because this is what the goat's eat on the farm. Each pyramid is hand-wrapped in waxed paper so that its bloomy rind can gain access to the air it needs to stay fresh and white. The taste is mild, and surprisingly lacks the expected tang of a goat cheese, rather it is smooth, and gentle. Pairs well with: Champagne or a dry Sauvignon Blanc. Ossau Iraty is a wonderful sheep’s milk cheese produced in a specific area of the French Pyrenées. The name is derived from the production area that includes two neighboring provinces: the Ossau Valley, located in the Bearn and Iraty, a forested area in the French Basque Pyrenées. Ossau Iraty is one large family of sheep’s milk cheeses from this general region that includes Abbaye de Belloc, Valle d’Aspe, Istara and several others. Milk for production comes from the local breeds of sheep, the Manech and Basco- Bearnaise. The practice of transhumance is still very much a feature of these regions, whereby the shepherds take their sheep to the upper mountain pastures during the summer months to graze on the rich summer grass and flowers. During this time, milking and cheesemaking take place in the mountain huts known as“cayolar,”where the shepherds live during the summer. In the autumn the sheep are brought back down to the lower slopes and kept closer to the farm. Cheeses made during the summer are traditionally prized above those made during the winter for their superior flavor. Ossau Iraty was granted AOC (name protected) status in 1980. The texture of Ossau Iraty is uniformly smooth, close and dense and yet remains supple. 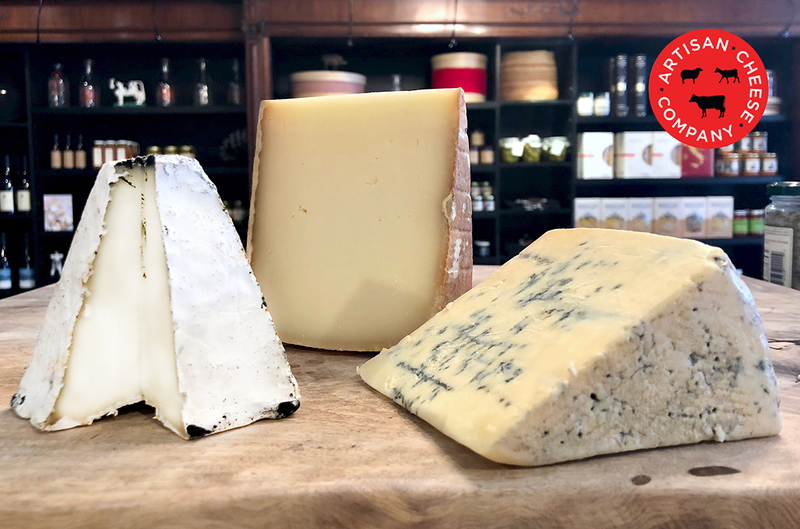 Flavors are sweet and nutty, with pleasant notes of earth, cellar - especially with the cheeses made during the winter - and flavors of grass, flowers and savory vegetal notes from the summer cheeses. Smell/Taste: sweet and rich with hints of hazelnut, grass, and honey. As farmers and ranchers, the Giacomini family have had a presence in Point Reyes for many decades. A descendant of Italian mountain dairy producers, Bob Giacomini began milking cows on his Point Reyes dairy in 1959. Over the years, Bob and his wife Dean, together with their four daughters, Karen, Diana, Lynn and Jill, developed a shared vision of producing an all-natural farmstead cheese. This dream was realized in August, 2000, when they founded Point Reyes Farmstead Cheese Company and produced the first vat of Original Blue. Milk comes from the Giacomini’s own closed herd of Holstein cows that grazes the pastures overlooking Tomales Bay. The piercing of the cheeses with stainless steel needles allows the air into the cheese, where it reacts with the enzymes and bacteria and causes the development of the blue veining. Finally cheeses are transferred into the the aging room where they are left to mature. Bay Blue are aged aerobically, exposed to air, while Original Blue matures in a sealed bag. As a result, Bay Blue progresses faster - it’s released at three months - and develops a thin, almost imperceptible rind. The brand new Bay Blue, the third in their cheese line up, delivers earthy sweetness with a fudgy texture. Michael’s Wine Cellar and Michael’s On East offer residents and visitors of Sarasota a variety of culinary experiences and special events to celebrate the start of summer this year. The arrival of the 2014 and 2015 vintages of Bordeaux available through Michael’s Wine Cellar will officially debut at Michael’s Bordeaux Wine Tasting at 6:30 p.m. on Saturday, June 9. The tasting featuring these highly-anticipated vintages will be hosted by Michael’s Wine Cellar Co-Proprietor Michael Klauber immediately following Klauber’s return from a Gulf Coast Connoisseur Club wine-buying journey through Bordeaux, France. Admission is $50 per person, with each guest receiving a $25 retail voucher for purchases of $50 or more to be utilized the evening of the tasting for the purchase of featured Bordeaux wines. Advanced reservations are required. Admission includes hors d'oeuvres and tastes of more than 20 Bordeaux wines.Each month, Michael’s Wine Cellar hosts a casual, walk-about tasting in the retail store. The June Open House Wine Tasting will be offered 2-4 p.m. on Saturday, June 2 at Michael’s Wine Cellar. Guests have an opportunity to taste dozens of international wines at this casual, walk-about tasting. Admission is $10 per person. No RSVP is required and guests may register online in advance or simply pay at the door. 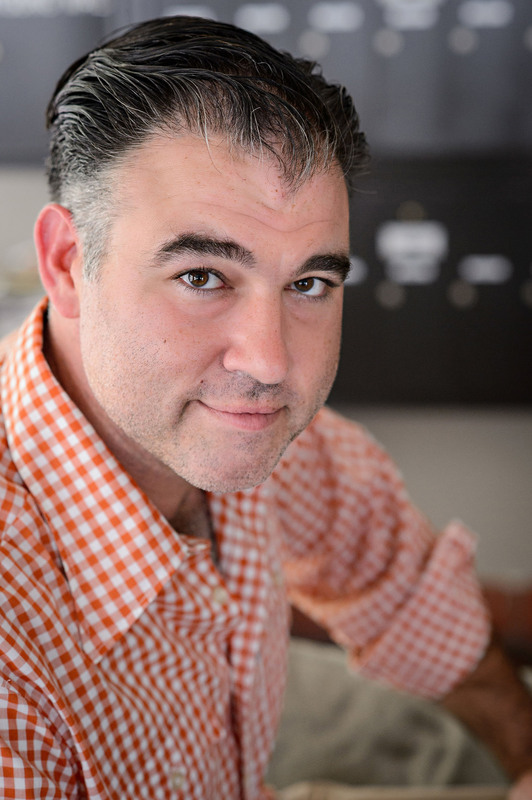 Continuing a popular series of educational wine classes, Michael’s “This Way! Three Way Wine Tasting” will be offered at 6:30 p.m. on Monday, June 11 at Michael’s Wine Cellar. Admission is $25 per person and advanced reservations are required. Michael's summer offerings, exclusive to members of its Gulf Coast Connoisseur Club loyalty program, continue weekly through October 2018. 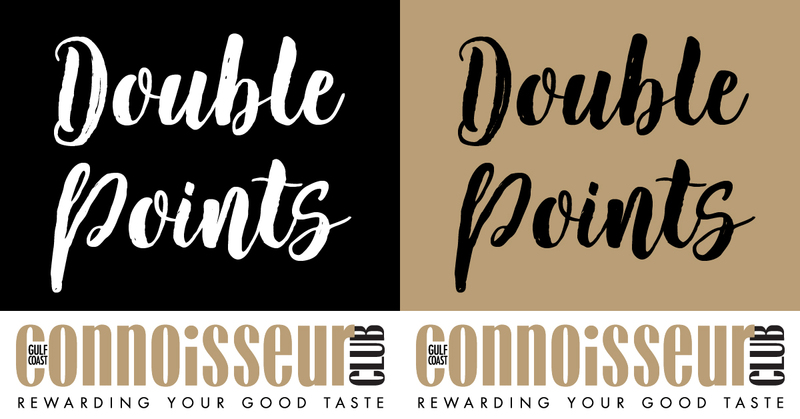 As part of Michael’s Double Points Days, members will earn double Gulf Coast Connoisseur Club points on Mondays, Tuesdays and Wednesdays during lunch and dinner at Michael's On East, plus double points on all retail purchases at Michael’s Wine Cellar on Thursdays. (Dine-in and in-store only. Not valid with any other offers or discounts.) Guests are also invited to enjoy half-priced bottles of wine on Thursdays in the Restaurant at Michael’s On East during lunch or dinner. Wine Lovers Thursdays present an opportunity to explore the 350-bottle wine program in the Restaurant which has been recognized with the “Best of Award of Excellence” from Wine Spectator. All are invited to join the Gulf Coast Connoisseur Club loyalty program which “rewards guests for their good taste” in the Restaurant, Wine Cellar or online at www.gulfcoastconnoisseurclub.com. The Savor Sarasota Restaurant Week celebration showcasing special-priced lunch and dinner menus at more than 90 participating restaurants returns June 1-14, 2018. 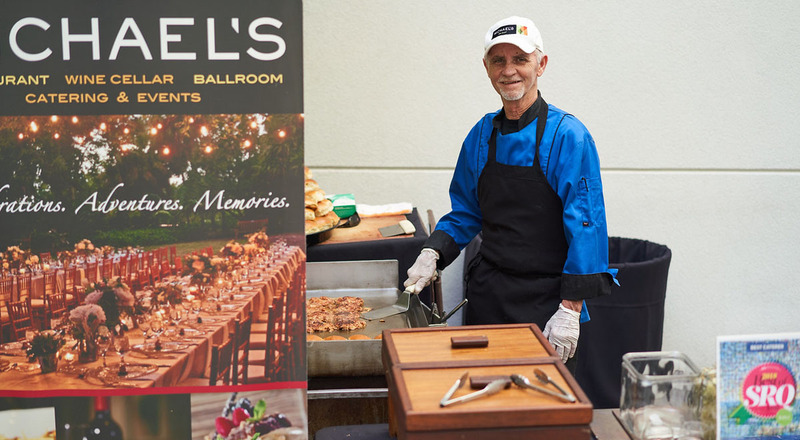 Coordinated by Visit Sarasota County, Michael’s On East has been a proud participating restaurant annually since this community-wide culinary celebration began in 2005. The Michael’s On East three-course “Savor Sarasota” dinner menu is available Monday through Saturday evenings for $32 per person, June 1-14, 2018. The two-course lunch offering features a choice of entrée and dessert for $16 per person and is available Monday through Friday, 11:30 a.m. to 2 p.m. Beginning on June 15 and continuing through June 30, Michael’s On East will extend the featured multi-course menus for $38.95 during dinner and $19.95 during lunch. For more information regarding Savor Sarasota Restaurant Week including chef profiles, a complete list of participating restaurants and menus, visit www.savorsarasota.com. For more information about Michael’s On East and Michael’s Wine Cellar offerings, call 941-366-0007, ext. 224 or continue browsing our website! We're celebrating the remarkable journey back home in Sarasota as well with a new cocktail menu featuring handcrafted cocktails made with Taylor Fladgate Ports. The new cocktails are being unveiled as the Klaubers and GCCC guests gear up for an exclusive visit to Taylor Fladgate on May 23, 2018! 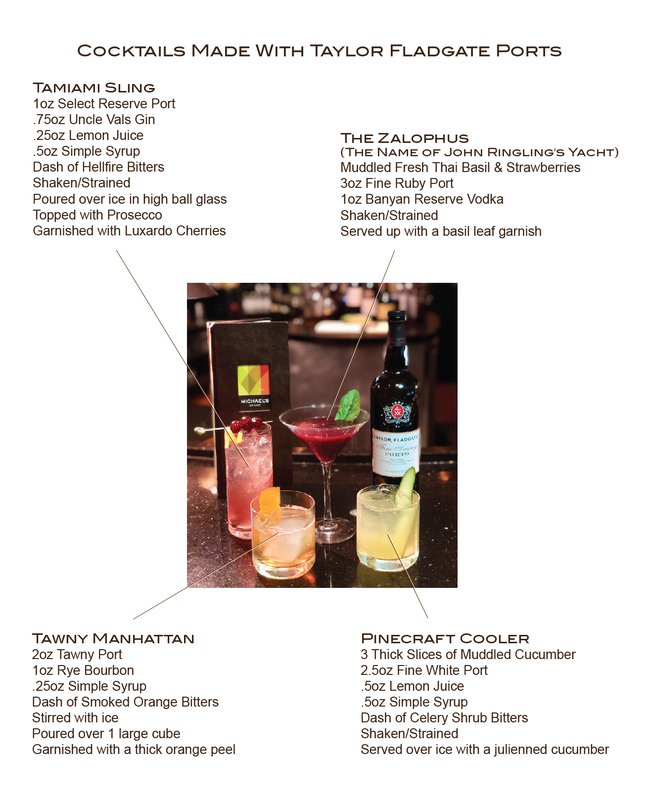 Be sure to stop into the Lounge and enjoy one of these fabulous cocktails, likely served up by mixologist Sam Mossler. Here at Michael's On East we are crazy about our cheese! We have a fabulous selection of meats and cheeses in our Made in America Charcuterie dinner starter! 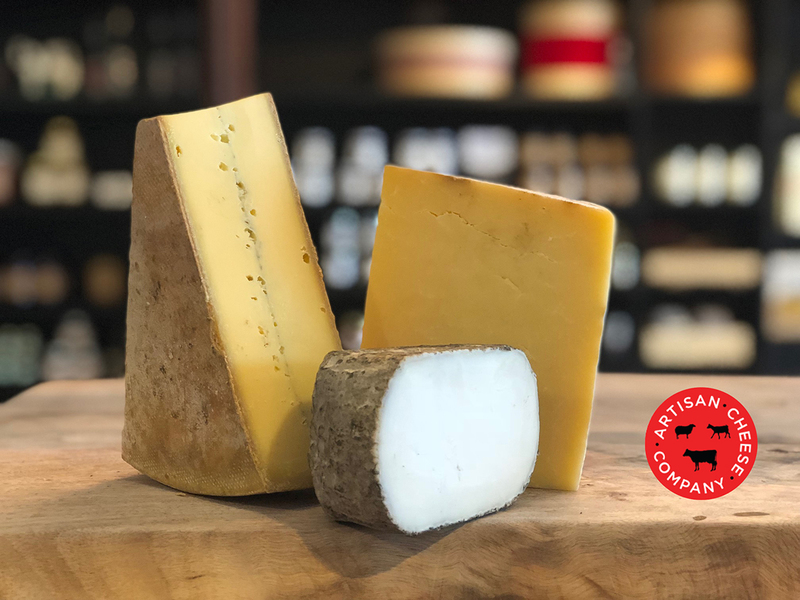 Right now (while supplies last) we are featuring three amazing cheeses from our friends at the Artisan Cheese Company! Rafael Baez, and Paloma, of Avila in Castilla y Leon, Spain – Raw Goat - Rind: Ash and Blue. One of the best soft-ripened goat cheeses around, Monte Enebro is only made by a single producer, Rafael Baez, and his daughter Paloma, of Avila in Castilla y Leon, Spain. This goat log has a dense, velvety interior and a pronounced peppery bite at the rind, which is covered with the same mold found inside blue cheeses, Penicillium Roqueforti. The goaty flavor is pronounced but not overpowering, and the blue spice is intense but incredibly well-balanced, because it doesn’t fully penetrate the paste as in most blue cheesesare milky, bright and refreshing, with hints of sweetness, butter and a slight cellar-like earthy-ness. On a trip to England, Karli and Jim Hagedorn were inspired by a program that taught city children about farming. Once home, they created the Farms for City Kids Foundation, a program that brings students from nearby cities, most of whom have never had the chance to travel, up to the farm in southwestern Vermont to spend time learning while helping out. The farm has a small herd of Jersey cows, vegetables, orchards and a maple sugar house that gathers from over 3,000 taps. Cheesemaking has recently been introduced as a means of financially supporting the foundation, and the Spring Brook Farm cheese house is designed with a glassed-in viewing area so the students can watch the cheesemakers while they work. Ashbrook, a pungent Morbier-inspired beauty, is distinguished by the line of vegetable ash running through the center of the cheese. Spring Brook’s partner dairies, Jericho Hill Farm and Fox Valley Farm, provide the raw Jersey cow’s milk for this new addition to the farm’s offerings. This cheese has a semi-soft, supple texture, and is lactic and bright with a decidedly funky finish. Try pairing with a slightly sour Berliner Weisse or an acidic Pinot Noir. Cheddar has been produced at Moorhayes farm near Wincanton in Somerset, England since 1898 when the Keen family family first moved there. Today the farm is still in the family. Stephen Keen and his son Nick oversee the cows and herd management, while Stephen’s brother George makes the cheese with his son James. Milk for cheesemaking comes from the farm’s closed herd of 250 Friesian-Holstein cows that are grazed on the pasture for much of the year. The cheddars produced by the Keens are, along with Montgomery’s and Westcombe, the most traditional English cloth wrapped cheddars available. George and James make 12-14 large wheels of cheese each day. The cheddars are made in two sizes, weighing either 30lb. (known as a half wheel) or the traditional size of 56lbs. After production and unmolding, wheels are wrapped in cheesecloth to protect them during the aging process. Cloth allows the cheese to breathe and lose moisture, and as a result the flavors concentrate. The resulting texture of a typical Keens cheddar is smooth, dense and firm. Occasionally, accidental veins of blue find their way into the cheese from the rind. Although technically speaking these are a fault, they taste delicious and add a subtle blue flavor to that part of the cheese. Flavors are complex and rich, with hints of butterscotch, nuts and fruit, accompanied by a distinctive tang and long finish. Take a virtual journey to another world at Michael's On East again this month! 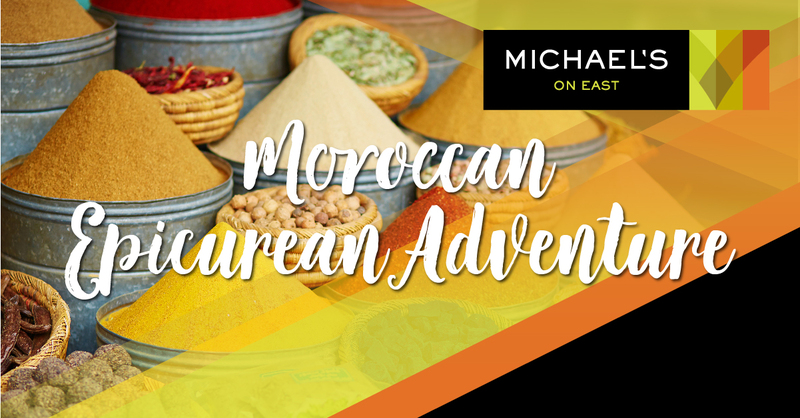 Coriander, cumin, curry and other seasonings combine to create refined flavors, with just the right touch of 'spice' as part of Chef Jamil's Moroccan Epicurean Adventure through the month of May. Enjoy this specialty three-course dinner menu for $38.95 per person. 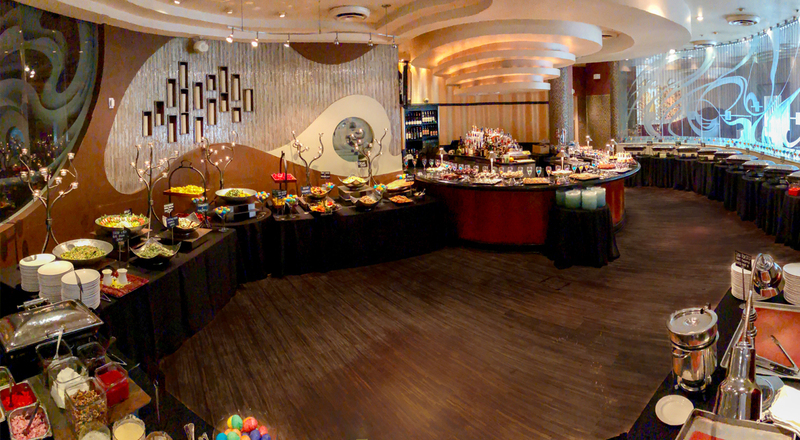 A two-course lunch offering includes a choice of entrée and dessert for $19.95 per person. Also take advantage of hand-selected wine pairings for $8 per glass or $15 for the pairing. Click here to view the complete monthly menu. Epicurean Adventure menus are NOT available on holidays including Mother's Day. The Restaurant & Wine Cellar will be closed on Memorial Day. Today, April 27, 2018, is the official 31st "birthday" of Michael's On East! Since the Restaurant's doors opened in 1987, the Michael's On East owners and team have enjoyed the great privilege of expanding into today's "empire," all thanks to you, our loyal guests. In our contemporary fine dining restaurant, boutique wine store and award-winning catering division, our focus on exceeding your expectations remains resilient. In honor of our anniversary, it's our pleasure to offer all guests—21 years of age and older, of course—a complimentary glass of François Montand Champagne. 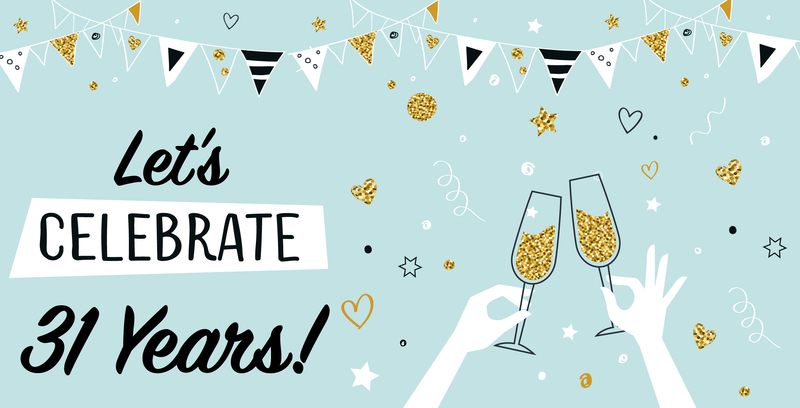 Please join us in the Restaurant today for lunch, happy hour or dinner to toast to many more years of special celebrations at Michael’s On East. We are pleased to share another featured recipe from the Michael's On East kitchen! As prepared by Michael’s On East Executive Chef Jamil Pineda and featured on the Southwest Epicurean Adventure lunch menu in the Restaurant through April 2018. Preheat the oven to 450 degrees F. In a small mixing bowl, add all the ground ingredients with the salt and sugar and mix well to make the crust. Coat the Mahi on both sides, in a sauté pan over medium high heat, add the oil and sear the fish on one side. Flip the fish and finish cooking in the oven for 4 to 5 minutes. Set aside until the dish is ready to be plated. Preheat the oven to 450 degrees F. Add the tomatillos to a baking sheet along with the jalapenos and onion wedges. Toss with 1 tablespoon of the olive oil and roast about 7 minutes in the oven. Turn the vegetables, add the garlic and roast until everything is slightly softened and charred, another 7 to 8 minutes. Set aside to cool. Peel the garlic and remove the stems and seeds from the jalapenos. Add the roasted vegetables to the bowl of a food processor and pulse until still slightly chunky but well combined. Add the cilantro, lime juice and 1 teaspoon salt and pulse until incorporated. With the processor running, stream in the remaining 3 tablespoons olive oil until the salsa is slightly runny but not smooth. Add more salt if desired. Add oil and butter to a large sauce pan over medium-high heat. Add the onions and cook, stirring occasionally, until soft, 3 to 4 minutes. Add garlic, jalapenos and corn. Cook for 1 to 2 minutes, stirring constantly. Add the rice and stir well to coat all grains. Add water and season with salt to taste. Stir once and allow water to come to a rapid boil. Cover and reduce heat to medium. Cook for 10 to 12 minutes, or until water has been absorbed. Remove from heat and allow pan to rest, covered, for 7 to 10 minutes. Uncover pan, add cilantro and lime juice. Fluff with a fork and serve immediately, adding a little bit more salt if necessary. Set aside until the dish is ready to be plated. Preheat the oven to 450 degrees F. In a small mixing bowl, add all the ingredients together. Place the tomatoes skin up on a baking sheet and roast for 8 minutes. Set aside until the dish is ready to be plated. Continue sugar, salt, pepper and vinegar together in a small mixing bowl. Stir until the sugar is dissolved. Add remaining ingredients and mix well. Set aside until ready to plate the dish. On 4 dinner plates place the rice at top of the plate. Add two tablespoons of the Salsa Verde next to the rice, then place the Mahi on top of the salsa. 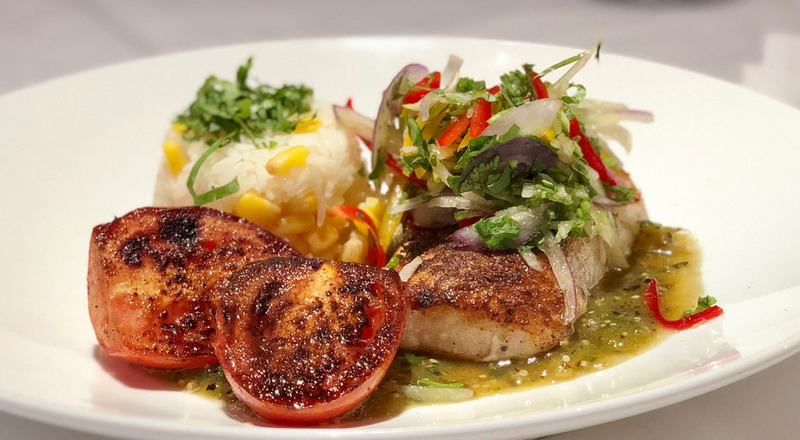 Place 3 halves of tomatoes next to the Mahi, the jicama slaw on top of the Mahi and add more chopped cilantro to garnish, if desired. Serve and enjoy! It’s known as one of the BEST events of Sarasota’s thriving social season for good reason. Our friends and partners at Sarasota Magazine know how to through a heck of a party at one of the area’s treasured venues, Selby Gardens! 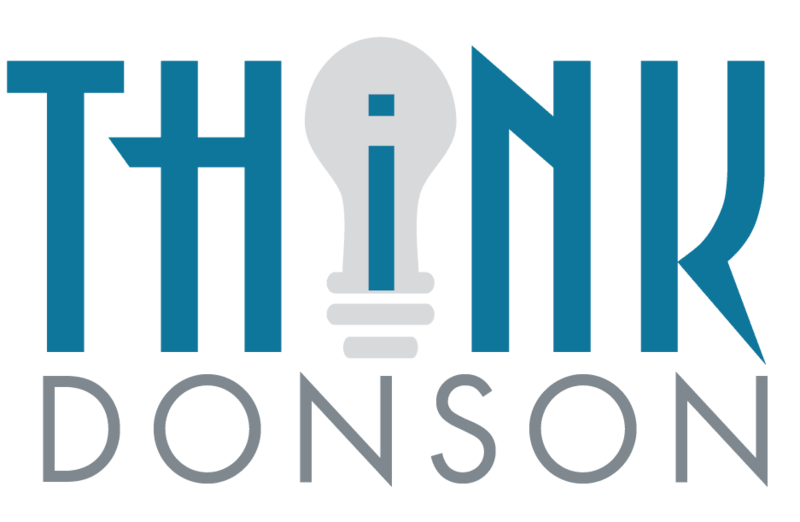 It’s become a favorite celebration of the business and philanthropic community and you are invited to join in the fun: “Get Primitive in Paradise” on April 24, 2018. Break out your island wear and dust off your grass skirt. It’s time for a Mai Tai and tiki torches! 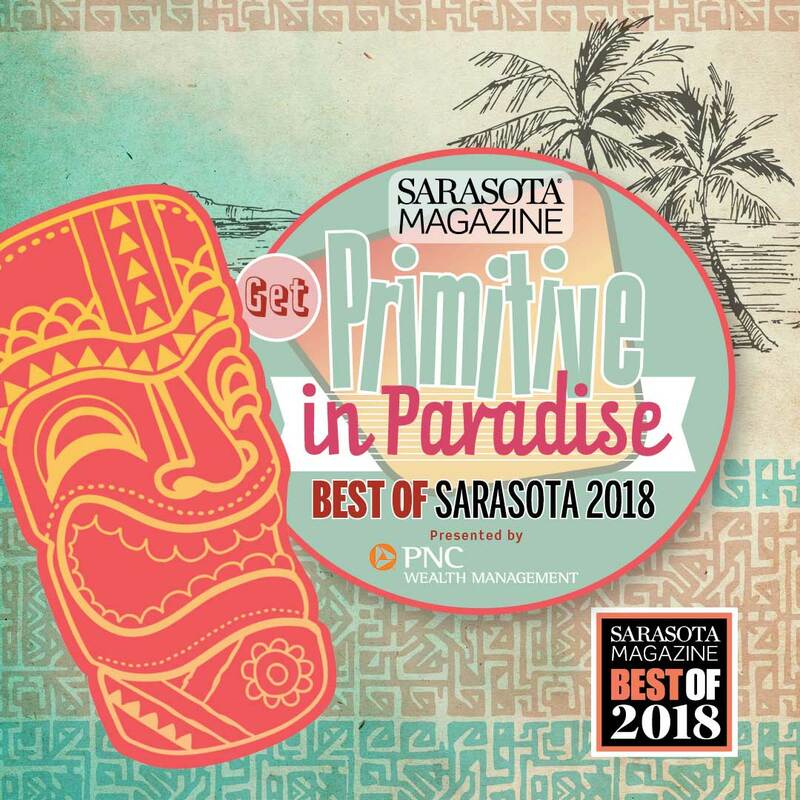 Join Sarasota Magazine as we celebrate our fabulous readers’ picks for the best restaurants and retailers, bars, brews and views...and lots, lots more! Party like a native on the tropical shores of Paradise at Selby Gardens. Sip signature cocktails and nibble on Sarasota-Manatee’s best bites. Feel the Spirit of Aloha as the torch lighting ceremony kicks off a night of endless wonder...the best party of the year! Dress in your fave Island Wear. Prizes will be awarded for the BEST! Big Kahuna V.I.P Party: 5-6 p.m. Tropical Tiki Extravaganza 6-8 p.m. The Michael’s On East three-course Southwest Epicurean Adventure dinner menu is available Monday through Saturday evenings for $38.95 per person, April 2-30, 2018. 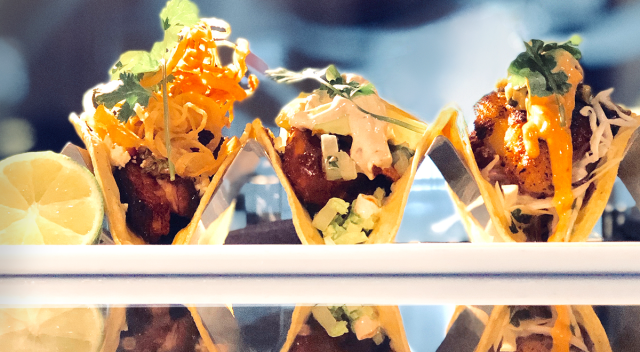 The two-course lunch offering features a choice of entrée and dessert for $19.95 per person and is available Monday through Friday, 11:30 a.m. to 2 p.m. For a “kick off your boots” culinary adventure, we encourage you to add wine perfectly-paired wines for $8 per glass or $15 for the pairing. 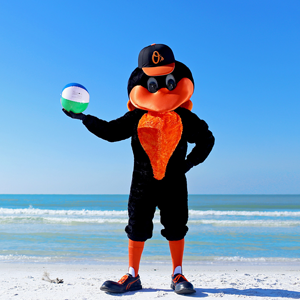 Sarasota: The charming town where fabulous restaurants, sublime natural attractions and the nation’s #1 beach combine with an amazing arts and culture scene. This spring, our team look forward to offering Michael’s cuisine at our gourmet food truck at Selby Gardens as the Asolo Repertory Theatre presents Shakespeare’s Much Ado About Nothing. Click here for performance dates and times. Michael’s “Food Factory” food truck will be open for all performances. It's always fun to be recognized among SRQ's "BEST!" The Michael's On East, Michael's Wine Cellar and Michael's Event & Catering teams thank the readers of SRQ Magazine for voting for our family of businesses yet again this year! One of our very best served up Andouille Sausage & Ground Beef Sliders with Blue Cheese, Pickled Okra & Alfalfa Sprouts at the SRQ Local TGIF Party celebrated on Friday, April 6. "Stevo" is a familiar face behind the bar at the community's grandest and largest galas and private parties catered by Michael's On East, for 20+ years, in fact! 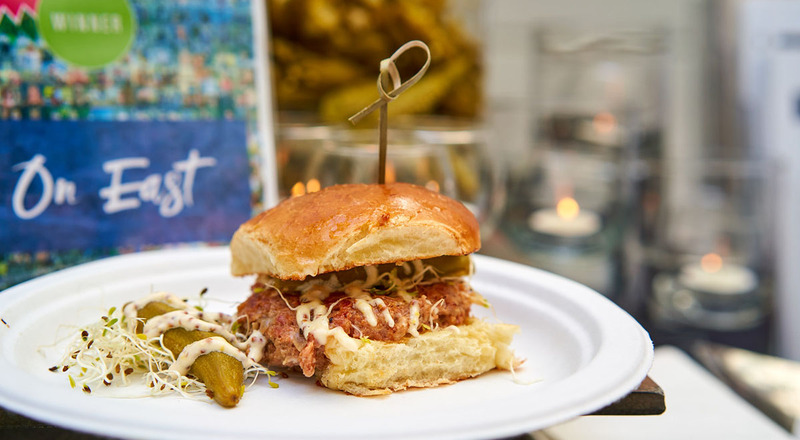 One of our very best served up Andouille Sausage & Ground Beef Sliders with Blue Cheese, Pickled Okra & Alfalfa Sprouts at the SRQ Local TGIF Party celebrated on Friday, April 6. "Stevo" is a familiar face behind the bar at the community's grandest and largest galas and private parties catered by Michael's On East, for 20+ years, in fact! He's one of our long-standing veteran team members within the Catering Division, and also a Vietnam War veteran. We thank Stevo for his service and are proud to have him on our team. He's certainly one of the best, and one of the many reasons the Michael's family of businesses are honored again in this year's Best of SRQ Local Reader Awards! Sarasota's only AAA Four Diamond Award Restaurant, Michael's On East currently has availability for our Mother's Day Brunch. We also provide dinner service on Mother's Day, 5-8 p.m., one of the select Sundays we open annually in the Restaurant! As a proudly independent, family-owned and operated restaurant, the entire Michael’s On East team takes special pride in offering holiday celebrations for our guests. Be sure to treat Mom to the best this year and join us on Mother's Day. Online reservations are available by clicking here, but not likely for long! Reservations are required for all holidays and Mother’s Day offerings do sell out each year. 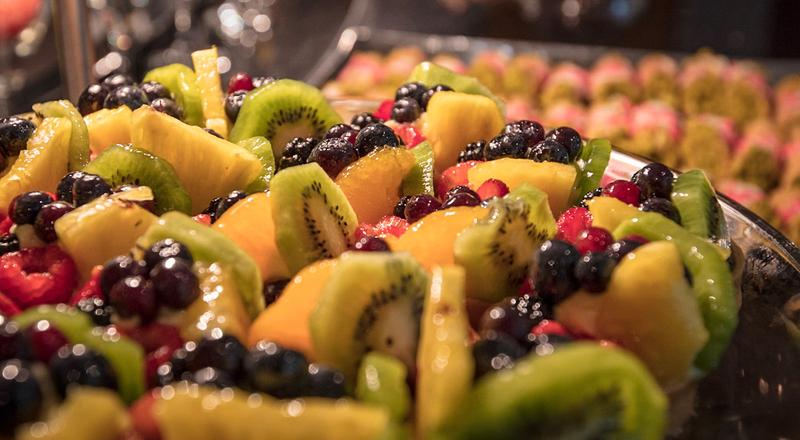 It is also our Catering team’s pleasure to provide magnificent brunch offerings for guests of Selby Gardens' holiday brunches, including their Mother's Day brunch. Click here for details about the Mother’s Day Brunch at Selby Gardens. 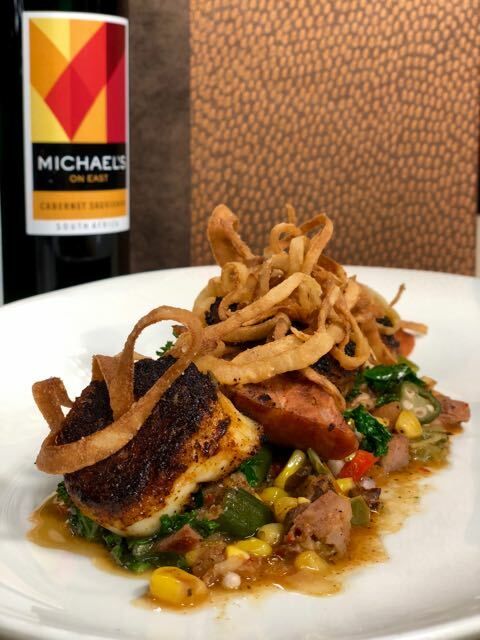 Michael’s On East features a Southwest Epicurean Adventure this month with creative dishes featuring dishes inspired by Southwest USA! Tasting Notes: Pale yellow with notes of lemon, peach and tropical fruit aromas. - Burgáns, a Celtic name, is the name of the slope where the winery is located, in the middle of Salnés Valley. From there, you can see amazing sightseeing's region and the Arousa Ría. A custom cuvée made for European Cellars by Martin Codax. Burgans is a cuvée made from a small selection of vineyard plots in the Salnes sub-zone of Rias-Baixas which have a characteristic pit-fruit quality and richness in addition to the bracing minerality for which the sub-zone is famous. Tasting Notes: A beautiful, deep, vibrant rose color. Has a surprising amount of body for a rose wine, and beautiful aromas of fresh, ripe wild strawberries. On the palate, the flavors of strawberries and young cherries come rushing in, accompanied by some spice notes and a clean, dry finish. 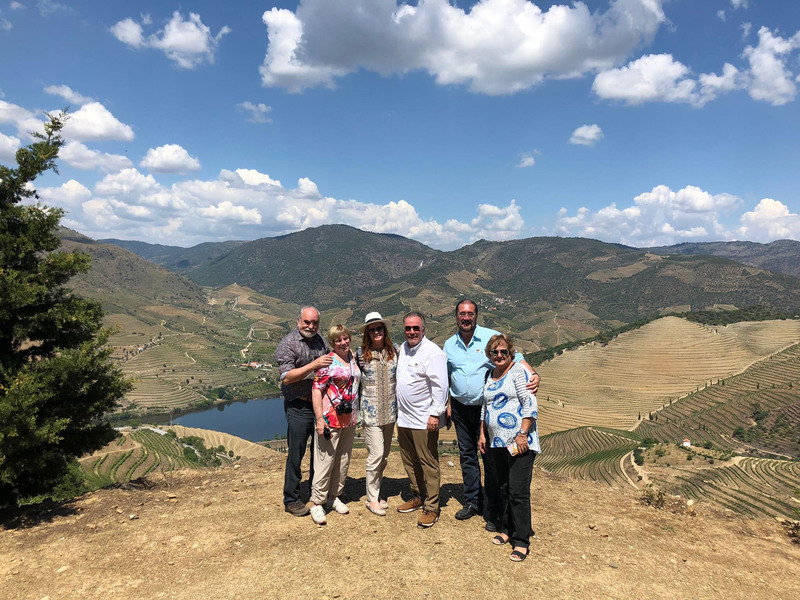 - After 22 years of winemaking, Susana Balbo has a strong sense of what she wants from her wines. From every harvest, she creates the grandest possible wines under her Susana Balbo label. To achieve this, she makes a rigorous selection of the finest barrels prior to making her final blends, dividing them into the parents (reserve level wines) and offspring or "crios. Michael’s On East, and our adjacent retail store Michael’s Wine Cellar and Ballroom will be host to multiple spirits programs focused on Whiskey this spring. In advance of St. Patrick’s Day, Michael’s On East has debuted a new Taste of Ireland Irish Whiskey Flight. Michael’s new Taste of Ireland Irish Whiskey Flight showcases Jameson, Redbreast 12 Yr, "Single Pot Still" Green Spot and Yellow Spot 12 Yr Irish Whiskeys. The $18 flight consists of four ½-ounce samplings of each featured whiskey. Klauber was among the first restaurateurs to offer wine flights in the Restaurant years ago. Today, his team continues to explore small batch and boutique spirits flights as part of the ever-changing beverage program in the Michael’s On East Lounge and Restaurant. In the fall of 2016, Klauber and his wife Terri visited Ireland and brought back a renewed focus on Irish Whiskey offerings for the Restaurant. Michael’s On East is located at 1212 East Avenue South, Sarasota, Fla. For reservations and more information, visit www.bestfood.com. Over the past decade Irish Whiskey has regained its preeminence as the world’s finest. Fans of Irish Whiskey are invited to stop into Michael’s adjacent wine and spirits store, Michael's Wine Cellar, for a special offer this week. Guests are invited to save 10% off featured Irish Whiskeys, March 12-17, 2018. The retail store is open 10 a.m. – 6 p.m., Monday – Saturday. 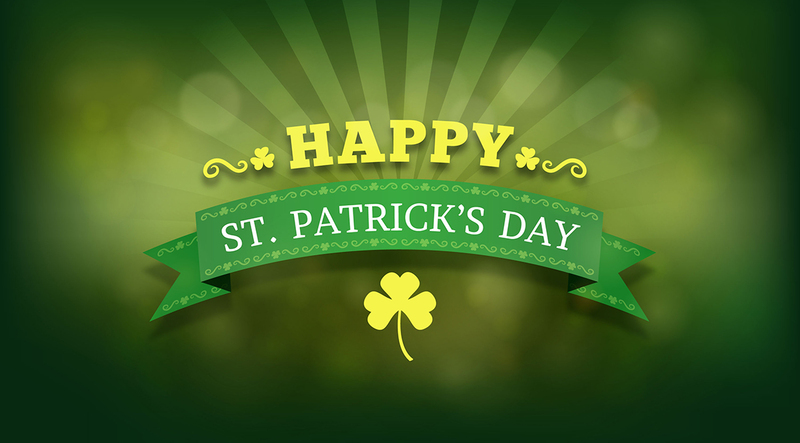 Those unable to visit the retail store who prefer to take advantage of wine offerings are invited save 15% of all wine when shopping online with the promotional code “StPats15” through michaelswinecellar.com on March 17, 2018. Michael’s Wine Cellar is located at 1283 S Tamiami Trail, Sarasota, Fla. The online store is available at www.michaelswinecellar.com. The Sixth Annual Whiskey Obsession Festival will be held April 11 to 14, 2018 at multiple venues throughout Sarasota. Produced by Turner C. Moore, Whiskey Obsession is the largest world whiskey festival in the U.S., with four days of classes, tastings, lunch and dinner pairings, expanded bartender academy, interactive panel discussions, cigars, VIP pours, a fabulous grand tasting with hundreds of whiskies to sample, and live music street party in the heart of downtown. Dozens of distillers and professional brand ambassadors from around the world travel to Sarasota to share their knowledge and passion for these fine spirits. Since the event’s inception, the Michael’s On East Ballroom has been host to the Whiskey Obsession Festival Grand Tasting, set for Saturday, April 14, 2018. Three ticket levels are available for the Grand Tasting, from $45 to $195 per person. To learn more about the Whiskey Obsession Festival and make reservations for all tastings and classes, visit www.whiskeyobsessionfestival.com. The luck of the Irish is truly taking FLIGHT at Michael’s On East this month. A tasting “flight,” a term used to describe a selection of wines, beers or spirits presented together for the purpose of sampling and comparison, is a great opportunity to broaden your experience with specialty beverages. Michael Klauber was among the first to offer wine flights in the Restaurant years ago, and in recent times, we’ve been exploring small batch and boutique spirits to add to our popular beverage menu in the Michael’s On East Lounge and Restaurant. On Michael & Terri’s recent exploration of Ireland they selected some new favorite Irish Whiskeys! 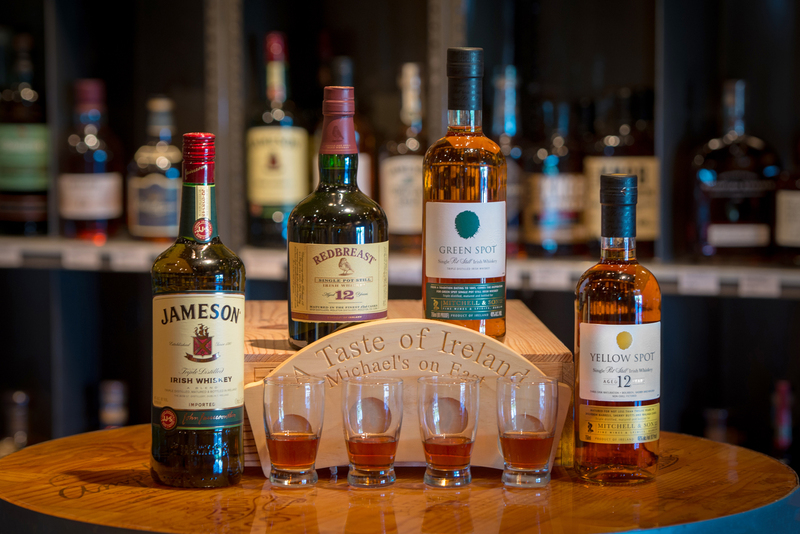 This month, as we prepare for St. Patrick’s Day celebrations, Michael’s new Taste of Ireland Irish Whiskey Flight debuts! Price: $18. The flight consists of four ½-ounce samplings of featured whiskey. No substitutions, please. Please read on for more information about each featured Irish Whiskey, and stop in the Restaurant soon to try the new Taste of Ireland Irish Whiskey Flight! Only in the last ten years has Irish Whiskey regained its preeminence as the world’s finest. Like its cousin Scotch, Irish Whiskey is initially aged in used oak bourbon casks for at least three years. What sets Irish Whiskey apart is the fact that the malt grains are dried in ovens rather than over peat fires, and it is distilled three times, unlike any other Whiskey. The result is a Whiskey that is pure, clean, and smooth. Likewise, Irish Whiskey is often aged in multiple barrels, lending it an unmatched smoothness and complexity. Jameson is the world’s largest-selling brand of Irish Whiskey. It is distilled three times for maximum smoothness and purity. Triple distilled and carefully blended for spice and flavor makes for one smooth final Whiskey. Nose: Nutty, rich and oily. There are notes of dried peels, ginger, linseed and cut fruits including a touch of melon. Palate: Spicy with great body. Nuts and citrus (peel and juice) with hints of marzipan, dried fruits and a hint of Sherry. You turn it over in your mouth forever. Nose: Hints of peppermint, malt, sweet barley, sugary porridge, creamy vanilla, papaya and citrus. Palate: Spicy and soft, gentle bourbon oak, green woods, menthol, potpourri. Finish: Creamy, long finish, vanilla. This is the second addition to the 'Spot' range of Irish whiskies, which contains the famous Green Spot Pot Still Whiskey. The Yellow Spot is a single pot still Irish Whiskey, which has been matured in three types of cask: American Bourbon cask, Spanish Sherry butts and Spanish Malaga casks for a sweeter flavor. The Michael’s On East three-course Baltimore Epicurean Adventure dinner menu is available Monday through Saturday evenings for $38.95 per person, March 1-31, 2018. The two-course lunch offering features a choice of entrée and dessert for $19.95 per person and is available Monday through Friday, 11:30 a.m. to 2 p.m. For a “Grand Slam” culinary adventure, we encourage you to add wine perfectly-paired wines for $8 per glass or $15 for the pairing.